Through February 28 – The Cinderella Project Donations at several locations in Greenville. If you’ve got some unused formal dresses you are willing to donate, this is a great place to do so, as well as any formal shoes and accessories, as this project is for girls who aren’t able to afford a dress and accessories for her prom or any other formal dance she may have the chance to attend. For more information send an email to elizabethmgailey@gmail.com or visit https://www.cinderellaprojectsc.com/where-to-donate. Through March 3 – “The Lion, The Witch, and the Wardrobe” at the Salvation Army Kroc Center in Greenville. The magical tale by C.S. Lewis is being brought to light in this performance by two adults who relive their adventures in Narnia on stage. For more information call (864) 235-2885 or visit https://scchildrenstheatre.org/shop/the-lion-the-witch-and-the-wardrobe/. Through March 3 – “Lucia di Lammermoor” at the Rodeheaver Auditorium of Bob Jones University in Greenville. The University Opera Association will present Donizetti’s “tale of love, betrayal, and madness” with guests Sarah Coburn, Yi Li, Mark Walters, and Kevin Thompson. For more information call (864) 242-5100 or visit https://www.bju.edu/events/fine-arts/concert-opera-drama/lucia.php. Through March 4 – “Unnatural History” at the Spartanburg Art Museum in Spartanburg. For more information call (864) 582-7617 ext. 254 or visit https://www.spartanburgartmuseum.org/unnaturalhistory. Through March 22 – The Cinderella Project Donations at several locations in Anderson. If you’ve got some unused formal dresses you are willing to donate, this is a great place to do so, as well as any formal shoes and accessories, as this project is for girls who aren’t able to afford a dress and accessories for her prom or any other formal dance she may have the chance to attend. For more information send an email to leslie@msslawfirm.net or visit https://www.cinderellaprojectsc.com/where-to-donate. Through April 21 – “Prince Caspian” at the Logos Theatre in Taylors. This is one production that will absolutely leave you spellbound, so if you get the chance, don’t miss the chance to see this fantastic theatrical production! For more information call (864) 268-9342 or visit https://www.theacademyofarts.org/events/category/prince-caspian/. February 28 – March 2 – “Frindle” at the Gunter Theater in Greenville. Based on the best-selling novel by Andrew Clements, tells the story of one students creation of a unique word and a teachers battle against its use. For more information call (864) 467-3000 or visit https://www.peacecenter.org/events/detail/frindle. March 2 – Concert Band & Soldiers’ Chorus at the Dorman High School Fine Arts Center in Roebuck. Come out and enjoy the U.S. Army Field Band & Soldiers Chorus “as they tell the story of America’s Army”. For more information call (864) 342-8922 or visit http://www.armyfieldband.com/schedule/concert-soldiers/eventdetail?eid=33563&group_id=1. March 2 – “The Young Islanders” at the Greenwood Community Theatre in Greenwood. The Greenwood Performing Arts performers will blend traditional Irish song and dance with jazz, folk, country and more! For more information call (864) 388-7800 or visit http://www.emeraldtriangle.us/Home/Components/Calendar/Event/5300/314?curm=3&cury=2018. March 2 – “An Evening of Original Music with Edwin McCain, Maia Sharp, and Gabe Dixon” at Genevieve’s Theater Lounge in Greenville. There is no greater fun than experiencing unique music with amazing artists in a cozy setting so come out for a relaxing evening of good music and great fun! For more information call (864) 467-3000 or visit https://www.peacecenter.org/events/detail/an-evening-of-original-music-with-edwin-mccain-maia-sharp-and-gabe-dixon. March 2 – Passport to the Arts at four locations around Clemson. Enjoy an immersion into food, art, music, and creativity at this “one-of-a-kind experience”. For more information visit http://www.clemsonpassport.org/. March 2 – “Little Red Riding Hood” at the Chapman Cultural Center in Spartanburg. This performance is a children’s opera based on the fairy tale, so bring your children out to expose them to this wonderful form of art! For more information call (864) 542-2787 or visit https://www.chapmanculturalcenter.org/pages/calendar/detail/event/c1/e1842/&DateOfEvent=03/02/2018. March 2 – 3 – Easy Bend IPRA Rodeo at the T. Ed Garrison Livestock Arena in Pendleton. Get out for some fun and enjoy all your favorite rodeo events! For more information call (864) 918-7633 or visit https://calendar.clemson.edu/event/easy_bend_ipra_rodeo_1525?utm_campaign=widget&utm_medium=widget&utm_source=Clemson+University#.WoCG2OjwayI. March 2 – 4 – Southern Home and Garden Show at the TD Convention Center in Greenville. Spring is just around the corner, so here is the chance to start considering those home and garden projects you’ve been talking about! For more information call (864) 233-2562 or visit http://tdconventioncenter.com/events/southern-home-garden-show/2018/03/02/. March 3 – South Carolina Federation of Museums Conference at the Oconee Heritage Center in Walhalla. This event is for those who work with small museums around the State to gain information on how to improve your museum, get questions answered, meet new people, and have a fun time in a beautiful location. For more information call (843) 689-6767 ext. 225 or visit https://www.southcarolinamuseums.org/conference. March 3 – “The Swinging Medalions” at the Walhalla Civic Auditorium in Walhalla. Enjoy a fun evening filled with Beach Music! For more information call (864) 638-5277 or visit http://www.walhallacivic.com/. March 3 – The Songwriter’s Workshop with Maia Sharp and Gabe Dixon at Ramsaur Studio in Greenville. If you’ve been working on a song and have found yourself struggling, these workshops are the place to go for guidance and professional support. For more information call (864) 467-3000 or visit https://www.peacecenter.org/events/detail/the-songwriters-workshop-with-maia-sharp-and-gabe-dixon. March 3 – The Cinderella Project at Aldersgate United Methodist Church in Greenville. Let those young ladies you know in this area in need of that special dress and accessories for her prom to stop by! For more information send an email to elizabethmgailey@gmail.com or visit https://www.cinderellaprojectsc.com/attend-a-boutique. March 3 – Upstate Regional Drill Competition at the Anderson Civic Center in Anderson. You’ll want to come out and support these talented individuals! For more information visit http://scdrills.org/. March 3 – Creative Poetry Workshop at the West Main Artists Co-Op in Spartanburg. If you enjoy writing poetry, come out and receive some tips on enhancing your skills. For more information send an email to jebo@bellsouth.net or visit http://www.westmainartists.org/3-3-18-poetry-j-brown. March 3 – Whole Hog Butcher Class at Greenbriar Farms in Easley. Learn the different parts of the hog and the art of butchery, with a farm to table lunch and take home some of the finished product. For more information call (864) 855-9782 or visit https://www.facebook.com/events/1685455611500271/. March 3 – 4 – “And The Gold Medal Winner Is ” at the Peace Center Concert Hall in Greenville. The Greenville Symphony Orchestra presents the Gold Medal Winner of the Van Cliburn International Piano Competition, Yekwan Sunwoo, who will present Rachmaninoff’s Third Piano Concerto. For more information call (864) 467-3000 or visit https://www.peacecenter.org/events/detail/and-the-gold-medal-winner-is. March 5 – “Gina Chavez” at the Brooks Center for the Performing Arts in Clemson. This bi-lingual Latin folk-singer/songwriter and her band will give you an exciting evening of great music! For more information call (864) 656-7787 or visit http://www.clemson.edu/centers-institutes/brooks/events/event.html?eventid=960037. March 5 – “Willie Nelson and Family” at the Peace Center Concert Hall in Greenville. With a six decade career, there is no need to identify the amazing talent of this historical country icon. For more information call (864) 467-3000 or visit https://www.peacecenter.org/events/detail/willie-nelson-family. March 5 – 7 – “Go Dog, Go” at the Gunter Theater in Greenville. Kids will certainly enjoy seeing P.D. Eastman’s famous book come to life on stage! For more information call (864) 467-3000 or visit https://www.peacecenter.org/events/detail/go-dog-go. March 6 – 8 – Workday Waterfall Tour at Devil’s Fork State Park in Salem. Take a tour with a ranger to view some of the most beautiful areas of the Upstate you have ever seen and enjoy two nights in one of the beautiful villa cabins. For more information call (864) 944-2639 or visit https://southcarolinaparks.com/products/10004687. March 6 – 24 – “The Flick” at the Warehouse Theatre in Greenville. You’ll meet three blue collar workers in a rundown filmhouse in Massachusetts and how they help one another through each stage of their lives. For more information call (864) 235-6948 or visit https://warehousetheatre.com/the-flick/. March 8 – 10 – ASAC Horse Show at the T. Ed Garrison Livestock Arena in Pendleton. This show will feature American Saddlebred, Hackney Ponies, and Road Horses. For more information call (704) 305-3446 or visit https://calendar.clemson.edu/event/asac_horse_show_3713?utm_campaign=widget&utm_medium=widget&utm_source=Clemson+University#.WpNK0qjwayI. March 8 – 11 – Table Rock Photography Workshop with Don McGowan at Table Rock State Park in Pickens. Here is a chance to work one on one with an extremely talented photographer to learn to take fabulous pictures in nature on your own. For more information call (864) 878-9813 or visit https://southcarolinaparks.com/products/10004652. 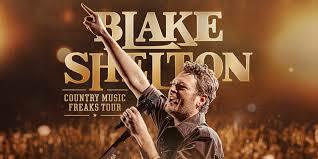 March 9 – “Blake Shelton: Country Music Freaks Tour” at the Bon Secours Wellness Arena in Greenville. He’s here at last, so don’t miss this chance to see this extremely talented Country artist live! For more information call (864) 241-3800 or visit http://www.bonsecoursarena.com/events/detail/blake-shelton. March 9 – 10 – “School of Hard Rocks Ballet” at the Gunter Theatre in Greenville. Dancers, musicians, and students from art-centric local schools will present a piece with well-known rock ballads that has an anti-bullying message that also shows “how art integration can heal diverse relationships and bring a community together”. For more information call (864) 467-3000 or visit https://www.peacecenter.org/events/detail/school-of-hard-rocks-ballet. March 9 – 11 – “Steel Magnolias” at the Spartanburg Little Theatre in Spartanburg. Enter the world of six “southern spitfires” from Louisiana whose lives are rocked by a life changing event that will have you laughing and crying and leaving a little more emotionally touched. For more information call (864) 585-8278 or visit http://www.spartanburglittletheatre.com/. March 9 – 17 – “The Wind and the Willows” at the Abbeville Opera House in Abbeville. Based on the children’s novel by Kenneth Grahame, is a show filled with adventure and mysticism, and is the perfect show to bring the entire family together! For more information call (864) 366-2157 or visit http://www.theabbevilleoperahouse.com/Shows. March 10 – “An Evening With Jason Mraz, Solo Acoustic” at the Peace Center Concert Hall in Greenville. This Grammy Award Winning artist with this folk-pop sound and positive message is coming to the area to share his talent and inspire those who love his music. For more information call (864) 467-3000 or visit https://www.peacecenter.org/events/detail/an-evening-with-jason-mraz-solo-acoustic. March 10 – Car Show at the Full House Sportzaria in Simpsonville. Bring our your car, or just come enjoy seeing some great cars with all proceeds to benefit Pendleton Place which works to keep children safe and help families in crisis. For more information visit http://www.sc5thgen.com/events-.html. March 10 – Walk for Water at the Library Bridge of Clemson University in Clemson. People in Countries all around the world struggle to have clean, safe drinking water, so come out and support this great cause being put on by students of Clemson University and what a great place to get to walk! For more information visit https://www.facebook.com/clemsonwalkforwater/. March 10 – Oyster Roast for Mitchell’s Light at the Big Water Marina on Lake Hartwell in Starr. You’ll enjoy all you can eat oysters, BBQ, side dishes, with raffles, a silent auction, and more, all to benefit local law enforcement and families impacted by tragedies. For more information call (864) 844-3602 / (864) 276-1816 or visit https://www.mitchellslight.org/upcoming-events/. March 11 – Celebrate Adoption Concert on the TD Stage at the Peace Center in Greenville. This will be a free outdoor concert with a guest speaker and several adoption, foster, and resource agencies available. In case of rain, the event will be moved to the Fellowship Hall of the First Presbyterian Church. For more information call (864) 235-0496 or visit http://www.firstpresgreenville.org/default.aspx?page=3061&eventId=4638. March 11 – “Daughtry” at the Peace Center Concert Hall in Greenville. Although he didn’t win American Idol, he showed the judges and fans alike that he has what it take to make it to the top, and now he’s here to show you in person! For more information call (864) 467-3000 or visit https://www.peacecenter.org/events/detail/daughtry. March 12 – “Clemson University symphonic Band” at the Brooks Center for the Performing Arts in Clemson. Come out and support these talented young adults as they performing a concert of wind and percussion music. For more information call (864) 656-7787 or visit http://www.clemson.edu/centers-institutes/brooks/events/event.html?eventid=960071. March 12 – “Miles Hoffman (viola) and Reiko Uchida (piano)” at the Daniel Recital Hall at Converse College in Spartanburg. You’ll enjoy an evening of extraordinary talent with these two fabulous musicians! For more information call (864) 596-9724 or visit https://www.converse.edu/event/miles-hoffman-viola-reiko-uchida-piano/. March 12 – 15 – Devils Fork Photography Workshop with Don McGowan at Devils Fork State Park in Salem. Learn the art of nature photography with a digital camera from this professional while enjoying a stay at one of the most beautiful parks in the State. For more information call (864) 944-2639 or visit https://southcarolinaparks.com/products/10004651. March 13 – “Hermitage Piano Trio” at the Brooks Center for the Performing Arts in Clemson. These three amazingly talented musicians will provide you an evening of free classical music you won’t want to miss! For more information call (864) 656-7787 or visit http://www.clemson.edu/centers-institutes/brooks/events/event.html?eventid=960091. March 13 – 18 – “The Color Purple” at the Peace Center Concert Hall in Greenville. This Tony Award Winning music revival about a young woman’s journey to love in the American South and will touch your heart unlike anything else. For more information call (864) 467-3000 or visit https://www.peacecenter.org/events/detail/the-color-purple. March 14 – Peace Talk: “The Color Purple” at the Huguenot Mill in Greenville. This talk with the shows’ Company will give you an in-depth look at the show and what it takes to put bring this show on stage. For more information call (864) 467-3000 or visit https://www.peacecenter.org/events/detail/peace-talk-the-color-purple. March 14 – “Celtic Woman Homecoming” at the Spartanburg Memorial Auditorium in Spartanburg. These four women with their magical voices and tremendous musical talent will create an evening you won’t ever forget! For more information call (864) 582-8107 or visit https://www.crowdpleaser.com/calendar/206/Celtic+Woman. March 15 – Oconee Bell Nature Walk at Devils Fork State Park in Salem. Take the opportunity to take a walk through this beautiful park while searching for this rare plant found only in this part of the State. For more information call (864) 944-2639 or visit https://southcarolinaparks.com/products/10003196. March 15 – April 8 – “Mamma Mia” at the Center Stage Theatre in Greenville. You are on a Greek island in paradise and on the eve of a girls wedding, she requests to know the identity of her father, bringing three men who believe they could be the one in this magical tale of “love, laughter, and friendship” in this enchanting tale of Abba’s songs. For more information call (864) 233-6733 or visit https://centrestage.org/mamma-mia/. March 16 – Mobile Meals Land Cruise: Paris at the Spartanburg Memorial Auditorium in Spartanburg. Take a “cruise” to Paris at this fund raising event where you will find five food buffets, live music, dancing, auctions, and even a cruise director! For more information call (864) 582-8107 or visit https://www.crowdpleaser.com/calendar/165/Mobile+Meals+Land+Cruise. March 16 – 18 – “Applause Talent” at the Spartanburg Memorial Auditorium in Spartanburg. If you enjoying seeing amazing talent, either enter to join the show, or come out and be an observer, as with three different levels of competition, there will be something for everyone to enjoy! For more information call (864) 582-8107 or visit http://www.applausetalent.com/. March 16 – 18 – Geico Bassmaster Classic at the Bon Secours Wellness Arena in Greenville. This world championship of professional bass fishing on Lake Hartwell in Anderson, with daily weigh-in ceremonies at the Arena so if you think of yourself as a champion, see if you can be the one to catch “the really BIG one!”. For more information call (864) 241-3800 or visit http://www.bonsecoursarena.com/events/detail/geico-bassmaster-classic. March 16 – 18 – Bassmaster Classic Expo at the TD Convention Center in Greenville. In conjunction with the tournament, here is your chance to find all the newest and best fishing equipment and outdoor gear while you are in town. For more information call (864) 233-2562 or visit http://tdconventioncenter.com/events/2018-bassmaster-classic-expo/2018/03/16/. March 17 – Bell Fest at Devils Fork State Park in Salem. Welcome in the spring with a day at this favorite State Park with live entertainment, food, nature walks, and more! For more information call (864) 944-2639 or visit https://southcarolinaparks.com/products/10004113. March 17 – St. Patty’s Day Dash & Bash at Flour Field at the West End in Greenville. The event will include a 5K and a Kids Fun Run, followed by live music, a costume contest, kid’s activities, and a whole lot of fun with proceeds to benefit Palmetto Children’s Charity, so get your green attire ready for this fun event! For more information send an email to mfields@palmettocc.org or visit https://www.stpaddysdashandbash.com/. March 17 – 18 – “Henri – Somatic Impressions Inspired by the Works of Henri Mattise” at the Gunter Theatre in Greenville. The Dance Theatre of Greenville will use their talent to create a portrayal of Henri Mattise’s masterful artwork through the art of dance. For more information call (864) 467-3000 or visit https://www.peacecenter.org/events/detail/henri-somatic-impressions-inspired-by-the-works-of-henri-matisse. March 19 – 22 – Hejaz Shrine Circus at the Spartanburg Memorial Auditorium in Spartanburg. The circus is in town and you won’t want to miss the fun and excitement of this exciting event for the entire family while helping the local Shriner’s raise money to help families of the Upstate! For more information call (864) 582-8107 or visit https://www.crowdpleaser.com/calendar/94/Hejaz+Shrine+Circus. Through February 29 – “Makenzye Barfield” Exhibit at the Aiken County Visitors Center in Aiken. See this month’s exhibit by this talented local artists. For more information call (803) 642-7557 or visit http://discoveraikencounty.com/event/makenzye-barfield-exhibit/2018-02-01/. Through March 7 – The Cinderella Project Donations at several locations in Orangeburg. If you’ve got some unused formal dresses, shoes, and/or accessories you are willing to donate, this is a great place to do so, as this project is for girls who aren’t able to afford a dress and accessories for her prom or any other formal dance she may have the chance to attend. For more information send an email to towens@scsolicitor1.org or visit https://www.cinderellaprojectsc.com/where-to-donate. Through March 16 – Teachers Choice Art Exhibit at the Center for the Arts in Rock Hill. You’ll have a chance to see worked by some of the most talented art students in Rock Hill. For more information call (803) 328-2787 or visit https://www.yorkcountyarts.org/2018-teachers-choice. February 28 – “TAO: Drum Heart” at the Newberry Opera House in Newberry. These internationally acclaimed percussion artists will astound you with their talent and their tremendous performance! For more information call (803) 276-6264 or visit http://www.newberryoperahouse.com/shows-and-events.html?show_name=tao-drum-heart. March 2 – “Atlanta Pops featuring Chloe Agnew and Dermot Kiernan” at the Newberry Opera House in Newberry. You’ll enjoy an evening of Broadway, Celtic, and pop music with these extremely talented musicians! For more information call (803) 276-6264 or visit http://www.newberryoperahouse.com/shows-and-events.html?show_name=the-atlanta-pops-f-chloe-agnew. March 2 – 3 – Pass It On Kidsignment at the First Baptist Church Life Center in Aiken. If you are in need of some kids’ items, this will be the place to come to see what you can find! For more information call (678) 859-2365 or visit http://passitonaiken2.com/. March 2 – 18 – “Savannah Sipping Society” at the Fort Mill Community Playhouse in Fort Mill. Fate brings four southern women together and their weekly happy hour gatherings turn into a mission to renew their enthusiasm for life! For more information call (803) 548-8102 or visit http://fortmillcommunityplayhouse.org/season.php. March 3 – The Green Gala: Midnight in the Garden at the Dairy Barn of the Anne Springs-Close Greenway in Fort Mill. This black tie optional event will include heavy hors d’oeuvres, live music, dancing, and a silent auction, with proceeds to benefit summer camp and recreational scholarships! For more information call (803) 547-4575 or visit https://www.ascgreenway.org/greenway-events/the-green-gala. March 3 – “The Last Five Years” at the Aiken Community Playhouse in Aiken. This show, which is a fundraising event, is about two New Yorkers who fall in and out of love for five years, but this version has a twist so come out and enjoy the show and support the Playhouse! For more information call (803) 648-1348 or visit https://app.arts-people.com/index.php?show=82438. March 3 – Wild Wonder Saturday at the Museum of York County in Rock Hill. Kids and their parents will learn how amphibians and reptiles wake up for spring. For more information call (803) 329-2121 or visit http://chmuseums.org/event/2361/. March 3 – “Sandi Patty” at the Newberry Opera House in Newberry. Fill your evening with beautiful contemporary Christian music with this artist with who won 40 Dove Awards! For more information call (803) 276-6264 or visit http://www.newberryoperahouse.com/shows-and-events.html?show_name=sandi-patty. March 3 – 31 – “The Fourth Cross” at the Narroway Theatre in Fort Mill. This Easter production is one performance you don’t want to miss! For more information call (803) 803-2300 or visit https://narroway.net/dinner-shows/fourth-cross. March 4 – Seuss-a-thon at the Main Street Children’s Museum in Rock Hill. 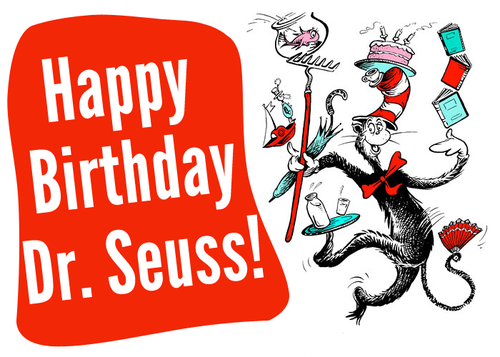 It’s Seuss’s birthday again, so bring the kids out for fun activities related to many of his famous stories! For more information call (803) 327-6400 or visit http://chmuseums.org/event/2365/. March 8 – Teachers Choice Art Exhibit Public Reception at the Center for the Arts in Rock Hill. You’ll see selected works from K through 12 created by students in the Rock Hill area. For more information call (803) 328-2787 or visit https://www.yorkcountyarts.org/2018-teachers-choice. March 8 – 11 – “The Little Mermaid, Jr.” at the Wood Auditorium in Camden. This fun story about a young mermaid who longs to leave her home is just the show to take your little ones to, and your big ones as well! For more information call (803) 425-7676 or visit http://www.fineartscenter.org/events/2018/03/08/mermaidshow17/. March 9 – Adventure Seekers Kids Night Out at the Adventure Center of the Anne Springs-Close Greenway in Fort Mill. Here is a chance to give your kids a break from you, and you a break from your kids, and they’ll have a fabulous time with indoor and outdoor activities and a pizza dinner. For more information call (803) 547-4575 or visit https://www.ascgreenway.org/events/detail/adventure-seekers-kids-night-out-53. March 9 – “Moon Mouse: A Space Odyssey” at the Newberry Opera House in Newberry. See this combination of lights and puppetry that creates a beautiful and creative show that also tells a story! For more information call (803) 276-6264 or visit http://www.newberryoperahouse.com/shows-and-events.html?show_name=moon-mouse-a-space-odyssey. March 9 – 10 – Home and Garden Show at the Western Carolina State Fairgrounds in Aiken. If you are looking for a place to start on those upcoming home and garden projects, this is the place to go! For more information visit https://www.visitaikensc.com/calendar/event/annual_spring_home_and_garden_show/. March 9 – 16 – Joye in Aiken at a variety of locations in Aiken. Come out and see some of the world’s best young musicians live! 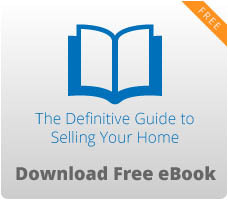 For more information call (803) 226-0016 or visit https://www.joyeinaiken.com/. March 10 – “Jo Dee Messina” at the USC Bundy Auditorium in Lancaster. You’ll enjoy an evening of fantastic music with this talented performer! For more information call (803) 289-1486 or visit https://www.lancastercitysc.com/events/regina-belle/. March 10 – Universal Martial Arts Championship at the Springdale Recreational Center in Lancaster. You’ll have a chance to see all ages and levels of competition at this event! For more information visit https://www.lancastercitysc.com/events/universal-martial-arts-championship/. March 10 – “Harry Potter Science Saturday” at the Museum of York County in Rock Hill. This is a day filled with all sorts of activities related to the Harry Potter stories, so bring the kids out and have a family day of fun! For more information call (803) 329-2121 or visit http://chmuseums.org/event/2362/. March 10 – “Interstellar Overdrive: A Saucerful of Pink Floyd” at the Sylvia Theater in York. Take a journey down memory lane with the songs from Pink Flloyd! For more information call (803) 684-5590 or visit http://sylviatheatre.com/. March 10 – The Cinderella Project at Catch the Vision International on Russell Street in Orangeburg. Here is a chance for young ladies who can’t afford a dress for their special dance to obtain one donated from a local individual as well as get matching accessories so she can enjoy her special day! For more information send an email to towens@scsolicitor1.org or visit https://www.cinderellaprojectsc.com/attend-a-boutique. March 10 – Food for the Soul One Day Round Robbin Tennis Tournament at the Tennis Center of Camden. If you enjoy participating in or just watching tennis, come out for a fun day with proceeds to benefit those who are hungry and homeless in the area. For more information call (803) 432-0252 or visit http://foodforthesoulkc.com/fundraisers/tennistournament/. March 10 – “Jeanna Robertson” at the Newberry Opera House in Newberry. This is one of the funniest clean comedy acts that come from Jeanna’s own life experiences, so don’t miss out on this show . . . you won’t regret it! For more information call (803) 276-6264 or visit http://www.newberryoperahouse.com/shows-and-events.html?show_name=jeanne-robertson-comedienne. March 10 – “Jon Reep” at the Sumter Opera House in Sumter. If you enjoy fun and laughter, you won’t want to miss seeing this talented comedian! For more information call (803) 436-2616 or visit http://sumtersc.gov/jonreep. March 10 – Spring-Fever: Wreath Making with Angie Clinton at the Center for the Arts in Rock Hill. Create a new wreath in time for spring! For more information call (803) 328-2787 or visit https://app.arts-people.com/index.php?ticketing=acyc. March 11 – “Dailey & Vincent Gospel Hour” at the Newberry Opera House in Newberry. Known as one of the most elite bluegrass bands in America, this will be a show not to be missed! For more information call (803) 276-6264 or visit http://www.newberryoperahouse.com/shows-and-events.html?show_name=dailey-vincent-gospel-hour. March 15 – “National Symphony Orchestra of Cuba” at the Newberry Opera House in Newberry. The Havannah Symphony has been around since 1960 introducing Cuban and Latin American music to the world, and with the few performances they are bringing to America, you won’t want to miss seeing this one in a lifetime show! For more information call (803) 276-6264 or visit http://www.newberryoperahouse.com/shows-and-events.html?show_name=the-natl-symphony-orch-of-cuba. March 16 – “Joal Rush Kaleidoscope Emotions Tour” at the Wood Auditorium in Camden. This Camden native who has traveled with numerous nationally renowned artists, such as Zac Brown Band and Edwin McCain, has returned after the completion of his new album to perform for his hometown crowd so come out and hear this extremely talented singer/songwriter/musician before he presents his work to the world. For more information call (803) 425-7676 or visit http://www.fineartscenter.org/events/2018/03/16/joalrush2018/. March 16 – “Beach Party Boys” at the Newberry Opera House in Newberry. This Beach Boys Tribute band will have you singing their songs for days to come! For more information call (803) 276-6264 or visit http://www.newberryoperahouse.com/shows-and-events.html?show_name=beach-party-boys. 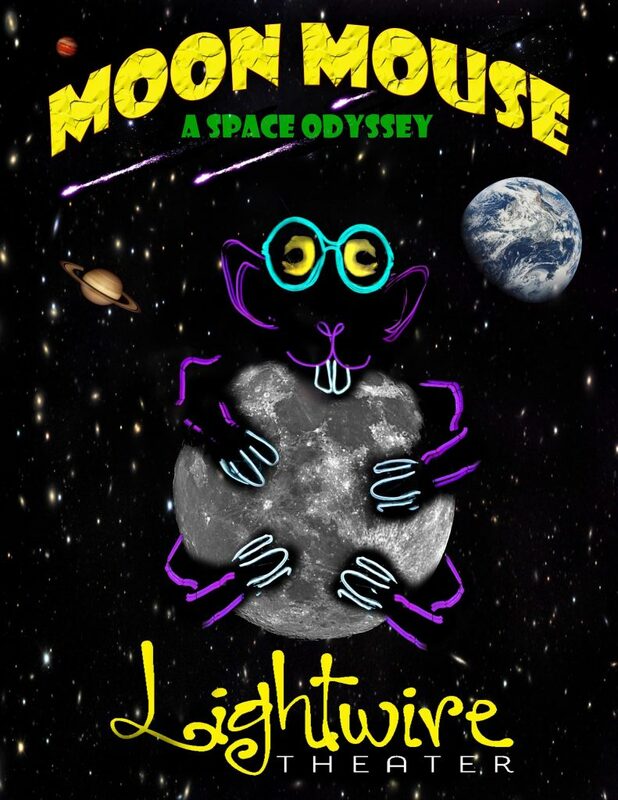 March 16 – “Moon Mouse: A Space Odyssey” at the Sumter Opera House in Sumter. This Lightwire Theater show will tell a story using lights and theater to create a mesmerizing show like nothing you’ve seen before, and the kids will absolutely love it! For more information call (803) 436-2500 or visit http://sumtersc.gov/lightwiretheater. March 16 – Bacon and Brews at the Newberry Street Festival Center in downtown Aiken. What better way to relax that with an evening of live entertainment by Tokyo Joe while you enjoy a feast of dishes made with bacon by local restaurants, and a variety of beers and wines to wash it down with. For more information visit http://www.aikenkiwanisclub.org/aikens-bacon–brews.html. March 17 – Mountain Bike Level 1 Clinic at the Adventure Road Entrance of the Anne Springs-Close Greenway in Fort Mill. Learn the art of mountain biking or enhance your skills with this clinic so bring your bike, your helmet, and some water for this afternoon clinic. For more information call (803) 547-4574 or visit https://www.ascgreenway.org/events/detail/mountain-bike-level-1-clinic. March 17 – Aiken Trials at the Aiken Training Track in Aiken. It’s that time of year again, so start backing for your tailgate party and a day filled with fun! For more information call (803) 648-4631 or visit http://www.aikentrainingtrack.com/#trials. March 17 – “Fancy Nancy: The Musical” at the Newberry Opera House in Newberry. Based on the award winning books by Jane O’Connor, this stage production will be a fun and enjoyable family event! For more information call (803) 276-6264 or visit http://www.newberryoperahouse.com/shows-and-events.html?show_name=fancy-nancy. March 17 – “Mark O’Connor Band” at the McCelvey Center in York. This three time Academy Award winner creates amazing music using his violin and his tremendous composing ability. For more information call (803) 684-3948 or visit http://chmuseums.org/event/2317/. March 18 – Camden Community Concert Band Winter Concert in the Camden High School Auditorium in Camden. Come out and enjoy a free event! For more information call (803) 425-7676 or visit http://www.fineartscenter.org/events/2018/03/18/winterband2018/. March 18 – “Artrageous” at the Newberry Opera House in Newberry. This show that will create art right before your eyes using music and choreography, as well as audience interaction, to make this a show you won’t soon forget! For more information call (803) 276-6264 or visit http://www.newberryoperahouse.com/shows-and-events.html?show_name=artrageous. March 18 – “The Spirit of Romanticism” at the Etherredge Center in Aiken. This performance by the Aiken Symphony Orchestra will include cellist, Sara Sant’Ambrogio and violinist, Sandy Cameron. For more information call (803) 295-0313 or visit http://aikensymphonyorchestra.com/. March 20 – Rise and Reign of the Mammals at the Museum of York County in Rock Hill. Learn about those mammals of the past that use to live here, but are here no longer. For more information call (803) 818-6767 or visit http://chmuseums.org/event/2326/. Through February 28 – Gullah Celebration at a variety of locations around the Hilton Head Island area. This fun annual event will immerse you in the Gullah culture of amazing food, dance, art, and so much more, so don’t miss out! For more information visit http://gullahcelebration.com/. February 28 – March 4 – Food and Wine Festival at a variety of locations around Charleston. This event will provide you with a chance to learn how to shuck an oyster, beer pairing, take an eco-tour, wonderful dinners, and so much more! For more information call (843) 727-9998 or visit https://charlestonwineandfood.com/. March 1 – “Quiltmakers of Gee’s Bend” at the Gibbes Museum of Art in Charleston. This is a film screening about the live and history of textile artists from a small town in Alabama. For more information call (843) 722-2706 or visit https://www.charlestoncitypaper.com/charleston/quiltmakers-of-gees-bend/Event?oid=15247711. March 1 – 3 – Myrtle Beach Marathon/Half Marathon/Marathon Relay/5K and a Family Fun Run at Grissom Parkway and 21 Avenue North in Myrtle Beach. Known as the flattest race and fastest race, there is something for everyone at this event. For more information visit https://mbmarathon.com/. March 2 – Charleston Wine & Pecha Kucha & Choir! Choir! Choir! At the Charleston Music Hall in Charleston. This will be an evening that starts out with food trucks fare, craft beer, wine, and cocktails, followed by a number of great speakers, followed by some fabulous music to round out the evening. For more information call (843) 853-2252 or visit https://www.charlestonmusichall.com/event/1651982-charleston-wine-food-pecha-charleston/. March 2 – “Scotty McCreery” at the House of Blues in Myrtle Beach. This winner of Season 10 of American Idol is still going strong, so don’t miss the chance to see this talented country singer live! For more information visit http://www.houseofblues.com/myrtlebeach/EventDetail?tmeventid=0E005437DEE07CA8&offerid=76067. March 2 – 3 – “A Hero’s Life” at the Gaillard Center in Charleston. This performance is presented by the Charleston Symphony Orchestra Masterworks. For more information call (843) 724-5212 or visit https://gaillardcenter.org/event/a-heros-life/. March 2 – 4 – Oyster Roast Trail Ride Weekend at the Mullet Hall Equestrian Center on Johns Island. Ride over 23 miles of scenic trails by day and relax and enjoy fun, good food, and fellowship by night. For more information call (843) 795-4386 or visit https://ccprc.com/Calendar.aspx?EID=8995. March 2 – 11 – “Cinderella” at the Main Street Youth Theatre on Hilton Head Island. This is sure to be one fantastic production, so come out and support the performers. For more information call (843) 689-6246 or visit http://msyt.org/shows/cinderella/. March 2 – May 26 – “Super Freak” at the Thirty-Four West Theatre Company in Charleston. Your evening will be filled with funky 70’s music while enjoying a soap opera drama about the scandal of the soap star superfly. For more information call (843) 901-9343 or visit https://www.34west.org/tickets/super-freak. March 3 – “Darren Knight’s Southern Mamma an Em Comedy Tour” at the Charleston Music Hall in Charleston. If you haven’t seen this comedian, you are in for a treat and a night filled with lots of laughter and humor you won’t soon forget! For more information call (843) 853-2252 or visit https://www.charlestonmusichall.com/event/1581248-darren-knights-southern-momma-charleston/. March 3 – Hoedown at the Oceanside Village Amenity Center in Surfside Beach. Enjoy an evening of dinner and dancing, with a silent auction, raffles, and more with proceeds to benefit the Barnabas Horse Foundation, an equine assisted therapy program that helps individuals and families recovering from a traumatic experience and helping children and adults with disabilities through the horse/human interaction. For more information visit http://www.barnabashorse.org/. March 3 – “Disney Live! Mickey & Minnie’s Doorway to Magic” at the North Charleston Performing Arts Center in North Charleston. Bring the kids out for a fun evening filled with 25 of your favorite Disney characters! For more information call (843) 529-5000 or visit https://www.northcharlestoncoliseumpac.com/events/detail/disney-live-mickey-and-minnies-doorway-to-magic-1. March 3 – Give Me Shelter Color 5K at the Recreational Complex in Moncks Corner. Proceeds from the race benefit the Callen-Lacey Center for Children. For more information call (843) 266-5200 or visit https://cydc.org/give-me-shelter-color-5k/. March 3 – Coastal Disability Ministry Summit at Pointe North Church in Moncks Corner. Come learn the three main ingredients that will help children and adults of all abilities to feel more included in your congregation. For more information call (843) 452-6216 or visit https://clcnetwork.org/events/charleston/. March 3 – Front Beach Fest at the Isle of Palms. Enjoy a family fun filled street festival with live entertainment, kids’ activities, arts and craft vendors, and local restaurants to provide you with a variety of food and drink. For more information call (843) 886-8294 or visit http://www.iop.net/island-gras. March 3 – “Graham Nash” at the Francis Marion University Performing Arts Center in Florence. This will be an intimate evening of songs and stories by this talented artist. For more information call (843) 661-4444 or visit https://fmupac.org/event/grahamnash/. March 3 – Jewelry-Making Workshop: Flower Drop-Lariat Necklace at the Gibbes Museum of Art in Charleston. Create your own beautiful necklace to take home. For more information call (843) 722-2706 or visit http://www.gibbesmuseum.org/programs-events/jewelry-making-workshop-flower-drop-lariat-necklace/255. March 3 – Amazing Race at Myrtle Beach State Park in Myrtle Beach. You’ll enjoy a fun day of friendly competition as you race around to a variety of stations along the way that will challenge your athleticism, problem solving skills, and team working abilities, so grab a partner and get ready for a challenge! For more information call (843) 238-0874 or visit https://southcarolinaparks.com/products/10004080. March 3 – Sand Dollar Schooling Horse Show Series at the Mullet Hall Equestrian Center on Johns Island. For more information call (843) 795-4386 or visit https://ccprc.com/Calendar.aspx?EID=8996. March 3 – Where the Wild Things Are 5K at the Caw Caw Interpretive Center in Ravenel. You’ll enjoy a scenic run/walk along the nature trails of the Center and just may see some wildlife along the way. For more information call (843) 795-4386 or visit https://www.ccprc.com/1455/Where-the-Wild-Things-Run-5K. March 4 – Garden Bros. Circus at the Florence Civic Center in Florence. Nothing brightens the spirits quite like a circus, so bring the children out for a fun show and create some memories! For more information call (843) 679-4525 or visit https://www.florencecenter.com/events/2018/gardenbros18. March 4 – “Lewis Black – The Joke’s On Us Tour” at the Gaillard Center in Charleston. This Grammy Award winning comedian is known as one of the most popular performers today, so don’t miss the chance to see him live! For more information call (843) 724-5212 or visit https://gaillardcenter.org/event/lewis-black-jokes-us-tour/. March 4 – “An Intimate Evening of Songs and Stories by Graham Nash” at the Charleston Music Hall in Charleston. This singer/songwriter, former of The Hollies and Crosby, Stills & Nash and is touring to give you an evening of great music and share some of his stories with you! For more information call (843) 853-2252 or visit https://www.charlestonmusichall.com/event/1568861-intimate-evening-songs-charleston/. March 4 – Palmetto Bluff Marathon / Half Marathon / 10K at the Palmetto Bluff in Bluffton. Choose your challenge that will take you along paved flat streets followed by an after party of live music, free beer, and BBQ sandwiches. For more information call (843) 815-1718 or visit https://runsignup.com/Race/Events/SC/Bluffton/PalmettoBluffHalfMarathon10K. March 5 – “Dixie Dregs” at the Charleston Music Hall in Charleston. Steve Morse and his original band have reunited in response to demands of devoted fans, so come out and enjoy a great show! For more information call (843) 853-2252 or visit https://www.charlestonmusichall.com/event/1561083-dixie-dregs-charleston/. March 5 – 11 – Wine and Food Festival at a variety of locations around Hilton Head Island. You’ll enjoy cooking classes, wine tasting, a fried chicken lunch, competitions, and more! For more information call (843) 686-4944 or visit http://hiltonheadwineandfood.com/. March 5 – 16 – Tea Room & Gift Shop at St. Pauls Summerville in Summerville. The menu includes She Crab Soup and Tomato Pie, as well as homemade desserts, and the gift shop has everything from wooden crafts to jewelry. For more information call (843) 873-1991 or visit http://www.stpaulssummerville.org/tea-room-gift-shop/. March 6 – History of the Marsh Tacky at the Morris Center for Lowcountry Heritage in Ridgeland. Learn the history of these native horses that are now on the endangered species list, with only 300 documented in existence. For more information call (843) 284-9227 or visit http://www.morrisheritagecenter.org/events/. March 6 – “Venice Baroque Orchestra” at the Gaillard Center in Charleston. This extremely talented group of musicians is committed to performing masterpieces from the 17th and 18th Centuries. For more information call (843) 724-5212 or visit https://gaillardcenter.org/event/venice-baroque-orchestra/. March 6 – “Fleet Foxes” at the North Charleston Performing Arts Center in North Charleston. Enjoy an evening of indie folk music with this talented band from Washington. For more information call (843) 529-5000 or visit https://www.northcharlestoncoliseumpac.com/events/detail/fleet-foxes. March 7 – 25 – “Avenue Q: The Musical” at the Dock Street Theatre in Charleston. This hilarious adult musical puppet show, winner of the Tony Awards “Triple Crown” for Best Musical, Best Score, and Best Book is not one you should miss if you love to laugh! For more information call (843) 577-5967 or visit https://www.charlestonstage.com/shows-and-tickets/54-avenue-q.html. March 8 – “Moon Mouse: A Space Odyssey” at the Francis Marion University Performing Arts Center in Florence. As seen on Americas Got Talent, you’ll enjoy a show that tells a story using lights, and will amaze and entertain the entire family! For more information call (843) 661-4444 or visit http://fmupac.org/event/moon-mouse-a-space-odyssey/. March 8 – 10 – National Shag Dance Championship at the Spanish Galleon at the Ocean Drive Beach & Golf Resort in North Myrtle Beach. If you are in the area, or just love shag dancing, you won’t want to miss seeing the best dancers from across the County as they complete for the identification of the National Best Shag Dance Team! For more information visit http://www.shagnationals.com/. March 8 – 11 – Hilton Head Wine and Food Festival at a variety of locations on Hilton Head Island. At this festival you’ll have a chance to attend workshops with chefs, learn about wines, enjoy wine tasting, eat delicious foods, and more! For more information call visit info@hiltonheadwineandfood.com. March 9 – “Casting Crowns” at the Florence Civic Center in Florence. Enjoy an evening of great Christian music with this amazing band! For more information call (843) 679-4525 or visit https://www.florencecenter.com/events/2018/casting-crowns. March 9 – “Cash Unchained: The Ultimate Johnny Cash Tribute” at the House of Blues in Myrtle Beach. Those Johnny Cash fans will certainly enjoy this show that will provide them with a walk down memory lane! For more information visit http://www.houseofblues.com/myrtlebeach/concert-events#/event-popup. March 9 – 10 – Cobblestone Quilters Guild Quilt Show at the Omar Shrine Temple Convention Center in Mount Pleasant. If you enjoy quilts, you are sure to see some of the best and most beautiful ones at this show, so be sure to stop by! For more information visit http://cobblestonequilters.com/show.htm. March 9 – 17 – “You Can’t Take It With You” at the Florence Little Theatre in Florence. You’ll meet two families, one that is eccentric but joyous, and the other unhappy, but when young love develops between the two families, things get quite interesting, and sometimes downright hysterical! For more information call (843) 662-3731 or visit http://www.florencelittletheatre.org/shows. March 9 – 25 – “Dial M For Murder” at the Footlight Players Theatre in Charleston. This Alfred Hitchcock thriller will give you a show that you are certain to enjoy and that will keep you guessing! For more information call (843) 722-4487 or visit https://www.facebook.com/thefootlightplayers/. March 10 – “Celtic Women: Homecoming” at the North Charleston Performing Arts Center in North Charleston. These four tremendous talented ladies will give you a show you will absolutely love and just in time for St. Patrick’s Day! For more information call (843) 529-5000 or visit https://www.northcharlestoncoliseumpac.com/events/detail/celtic-woman-homecoming. March 10 – Celebration L’Italia at the Gaillard Center in Charleston. The Charleston Symphony Orchestra will take you on a trip to Italia providing you with old and new music, as well as a guest soloist to offer you some Italian opera. For more information call (843) 724-5212 or visit https://gaillardcenter.org/event/celebrate-litalia/?instance_id=743. March 10 – St. Patrick’s Day Block Party in the Old Village on East Montague Avenue in North Charleston. Enjoy this fun family holiday with three stages of live music, street vendors, arts and craft vendors, local restaurant food fare, lots of kids activities, and even a mechanical bull! For more information call (843) 740-5854 or visit http://www.northcharleston.org/Residents/Special-Events/St-Patrick-s-Day-Block-Party.aspx. March 10 – ArtFest at the Mount Pleasant Town Center in Mount Pleasant. This annual event will showcase some of the best local music, dance, and visual artists, so come out and enjoy the shows! For more information call (843) 884-8517 or visit https://experiencemountpleasant.com/events/artfest/. March 10 – Pacing for Pieces 5K Run/Walk & Half-Marathon and Piece Jam Festival in downtown Florence. Created to raise money and awareness to those struggling with autism and their families with a festival following the races that will include live music, food, drinks, and prizes! For more information call (843) 472-5215 or visit http://pacingforpieces5krunwalkhalfmarathon.itsyourrace.com/event.aspx?id=8540. March 11 – Homeless to Hope Benefit Concert at the Gaillard Center in Charleston. You’ll enjoy an evening with music by nationally acclaimed artists to include Charleton Singleton and Heather Rice with proceeds to benefit the Homeless to Hope Fund created by the Mayor in an effort to try to end homelessness in the tri-county area. For more information call (843) 724-5212 or visit https://gaillardcenter.org/event/homeless-to-hope/?instance_id=814. March 11 – St. Patrick’s Day Parade on Pope Avenue on Hilton Head Island. If you are on the Island for St. Patrick’s Day, be sure to come out for this fun annual event! For more information call (855) 287-7287 or visit https://www.hiltonheadireland.org/. March 11 – Oyster Roast & Chili Cook-Off at Lowndes Grove in Charleston. Bring on your special chili for the contest, or just come out and enjoy an afternoon of great food, live music, wine and craft beer, and fun games for all ages, with proceeds to benefit young women in need. Enjoy For more information send an email to Events@FlorenceCrittentonSC.org or visit https://forms.donorsnap.com/form?id=18630e49-a3c5-4654-9eee-342b42aadb97. March 13 – 17 – Charleston Fashion Week on Marion Square in downtown Charleston. This event showcases some of Charleston’s most fashionable boutiques, with designers and models from all over the country participating, and including lots of fun activities surrounding the event. For more information visit http://www.charlestonfashionweek.com/. March 15 – America Before the Revolution at the Morris Center for Low Country Heritage in Ridgeland. You’ll enjoy this historical program that shares about the French Huguenots that settled in Port Royal Sound, and the turn of events that prevented us from speaking French in South Carolina today. For more information call (843) 284-9227 or visit http://www.morrisheritagecenter.org/events/. March 15 – “Derek Warfield & The Young Wolfe Tones” at the Charleston Music Hall in Charleston. Stated as presenting “an old tradition in a new package”, this former founder and leader of the original Wolfe Tones, he is now joined by a younger generation of Irish musicians to create something for the future of Irish music. For more information call (843) 853-2252 or visit https://www.charlestonmusichall.com/event/1624285-derek-warfield-young-wolfe-charleston/. March 15 – Catch the Leprechaun 5K Run/Walk at the Mount Pleasant Waterfront Park in Mount Pleasant. The course will offer you the opportunity to enjoy the Cooper River Bridge, the USS Yorktown, and the Charleston Harbour, and a fun celebratory after party with live music and a “pot of gold” for the winners! For more information visit http://www.catchtheleprechaun5k.com/. March 15 – 17 – “The Avett Brothers” at the House of Blues in Myrtle Beach. This American folk rock band from North Carolina will present an enjoyable show with their touching and meaningful songs! For more information visit http://www.houseofblues.com/myrtlebeach/concert-events#/event-popup. 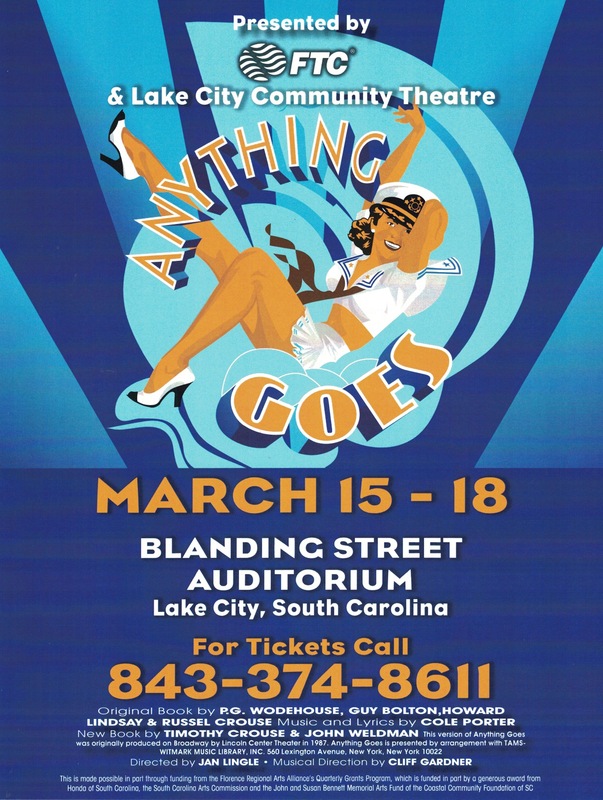 March 15 – 17 – “Anything Goes” at the Blanding Street Auditorium in Lake City. This 1934 musical is about an ocean liner bound from New York to London, and the crazy events that occur along the way! For more information call (843) 374-8611 or visit http://lakecitycommunitytheatre.org/WP/wp-content/uploads/2018/01/18AGScan.jpeg. March 15 – 31 – Festival of Houses and Gardens in the Old and Historic District in Charleston. Who doesn’t love downtown Charleston in the spring, and who wouldn’t enjoy the chance to enter some of the most beautiful homes and gardens in the area, so be sure to sign up for this exciting event! For more information visit http://www.historiccharleston.org/blog/events/category/festival-houses-gardens/. March 16 – 18 – Charleston Antiques Show at the Gaillard Center in downtown Charleston. If you love antiques, you won’t want to miss this chance to search for something special or just come out and see some of the most amazing antiques while enjoying the beauty of this amazing city! For more information visit http://www.historiccharleston.org/blog/events/category/charleston-antiques-show/. March 17 – “Good Night Moon” & “The Runaway Bunny” at the Gaillard Center in Charleston. Young children will really enjoy this show presented by the Mermaid Theatre of Nova Scotia. For more information call (843) 724-5212 or visit https://gaillardcenter.org/event/goodnight-moon-and-runaway-bunny/?instance_id=698. March 17 – “The Fab Four Tour: The Ultimate Beatles Tribute Band” at the Charleston Music Hall in Charleston. For the Beatles fans out there, here is yet another tribute band to take you on a journey down memory lane. For more information call (843) 853-2252 or visit https://www.charlestonmusichall.com/event/1544834-fab-four-charleston/. March 17 – St. Patrick’s Day Parade & Festival on Main Street in North Myrtle Beach. Put on your “green” and enjoy a day filled with fun activities to include a parade, three stages of live music, children’s activities, including rides and amusements, along with arts and craft vendors, a variety of tasty foods, beverages, and a whole lot of fun! For more information visit http://parks.nmb.us/festivalsevents/festivals/st-patricks-day-parade-and-festival/. March 17 – Shamrock 5K Run & Health Walk on Pope Avenue at the Heritage Plaza on Hilton Head Island. Put on your favorite green holiday attire and start your day with a run or walk around the Island, followed by a party by New York City Pizza that will include refreshments, pizza, live music, and door prizes. For more information call (843) 757-8520 or visit http://bearfootsports.com/shamrock-run.html. March 17 – St. Patrick’s Day Parade on King Street in downtown Charleston. What is St. Patrick’s Day without a fun parade, so come out and enjoy this fun event. For more information visit https://charlestonstpatrickdayparade.wordpress.com/. March 17 – Walk for Water at Riverfront Park in North Charleston. Thousands upon thousands of people around the world lack the luxury of fresh, clean drinking water, so come out and support this effort to raise money to help provide this necessary resource to those in need. For more information visit http://events.watermissions.org/site/TR?fr_id=1811&pg=entry. March 17 – The Cinderella Project at John Wesley United Methodist Church in Charleston. Here is a chance for young ladies who can’t afford to purchase a new dress and accessories for their special dance to come out and select one from those donated as well as the accessories to complete the outfit. For more information send an email to sfragale@turnerpadget.com or visit https://www.cinderellaprojectsc.com/. March 17 – Swamp Fox Adventure Race in the Francis Marion National Forest but meeting at the Town Hall in McClellanville. If you like adventure challenges, this is the event for you, with a half a day trip across land (mountain biking 30-45 miles), swamp (trekking 10–15 miles), and water (paddling 8 miles) rarely seen by others, providing some of the most difficulty obstacles you may have ever faced, with the chance to go solo, or share the adventure with one, two, or three others. For more information call (803) 292-1900 or visit http://www.kandoadventures.com/swamp-fox. March 17 – Edisto Beach Road Race at Wyndam Ocean Ridge Recreation Center on Edisto Island. Enjoy a 5K or a 1 mile run/walk for your St. Patrick’s Day! For more information call (843) 869-3867 or visit https://runsignup.com/Race/SC/EdistoBeach/7thAnnualEdistoBeachRoadRace. March 17 – Hunting Island Adventure Biathlon at Hunting Island State Park Nature Center & Russ Point Landing on Hunting Island. Grab a partner or go solo for this fun event that will include a 6 mile paddle (kayak or paddle board) and a 3.6 mile run. For more information call (843) 838-2008 or visit http://www.huntingislandbiathlon.com/. March 18 – “Matisyahu – Forest of Faith Tour” at the House of Blues in Myrtle Beach. This reggae band will provide you a faith filled and inspirational concert like you’ve never seen before! For more information visit http://www.houseofblues.com/myrtlebeach/concert-events#/event-popup. March 18 – “Travis Tritt” at the Charleston Music Hall in Charleston. This event rescheduled from January brings this award winning Country artist in for what is sure to be a tremendous show! For more information call (843) 853-2252 or visit https://www.charlestonmusichall.com/event/1592306-travis-tritt-charleston/. March 18 – Race and Roast at Oakland Plantation in Mount Pleasant. The day will begin with a trail run through the beautiful 132 acres of this fabulous plantation, followed by live music, all you can eat oysters, chili and hotdogs, wine and beer, hay rides, other fun kid activities, and a fun day in a lovely place! For more information call (843) 224-1849 or visit http://eastcooperland.org/race-roast-2018/. March 19 – “Colson Whitehead: The Underground Railroad Paperback Tour” at the Charleston Music Hall in Charleston. This best-selling author and Pulitzer Prize winner will share about his research and writing of the book, with each attendee receiving a signed copy of his book. For more information call (843) 853-2252 or visit https://www.charlestonmusichall.com/event/1615717-colson-whitehead-underground-charleston/. March 20 – Ovation Concert Finale at the Dock Street Theater in Charleston. You’ll enjoy some fabulous chamber music in this collaboration of the Chamber Music Charleston and the Musica en Seguara Festival in Spain. For more information call (843) 763-4941 or visit http://chambermusiccharleston.com/th_event/prelude/. March 20 – 25 – “Beautiful: The Carole King Musical” at the North Charleston Performing Arts Center in North Charleston. This production will give you a glimpse into the life of the musical star, Carole King and her climb to stardom. For more information call (843) 529-5000 or visit https://www.northcharlestoncoliseumpac.com/events/detail/beautiful-the-carole-king-musical.